FrameMaker 9, editing a document in Structured Mode on Windows Vista. Adobe FrameMaker is a document processor designed for writing and editing large or complex documents, including structured documents. It is produced by Adobe. FrameMaker maintains a strong following among professional technical writers. 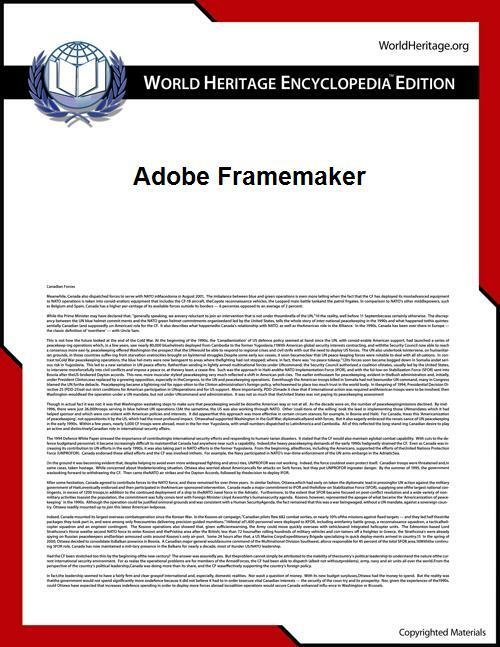 FrameMaker became an Adobe product in 1995 when Adobe purchased Frame Technology Corp. Adobe added SGML support, which eventually morphed into today's XML support. In April 2004, Adobe stopped supporting FrameMaker for the Macintosh. This reinvigorated rumors surfacing in 2001 that product development and support for FrameMaker were being wound down. Adobe denied these rumors in 2001, later releasing FrameMaker 8 at the end of July 2007, FrameMaker 9 in 2009, FrameMaker 10 in 2011, FrameMaker 11 in 2012, FrameMaker 12 in 2014, and FrameMaker 2015 in June 2015. FrameMaker has two ways of approaching documents: structured and unstructured. Structured FrameMaker is used to achieve consistency in documentation within industries such as aerospace, where several models of the same complex product exist, or pharmaceuticals, where translation and standardization are important requirements in communications about products. Structured FrameMaker uses SGML and XML concepts. The author works with an EDD (Element Definition Document), which is a FrameMaker-specific DTD (Document Type Definition). The EDD defines the structure of a document where meaningful units are designated as elements nested in each other depending on their relationships, and where the formatting of these elements is based on their contexts. Attributes or Metadata can be added to these elements and used for single source publishing or for filtering elements during the output processes (such as publishing for print or for Web-based display). The author can view the conditions and contexts in a tree-like structure derived from the grammar (as specified by the DTD) or as formatted in a typical final output form. Unstructured FrameMaker uses tagged paragraphs without any imposed logical structure, except that expressed by the author’s concept, topic organization, and the formatting supplied by paragraph tags. When a user opens a structured file in unstructured FrameMaker, the structure is lost. MIF (Maker Interchange Format) is a markup language that functions as a companion to FrameMaker. The purpose of MIF is to represent FrameMaker documents in a relatively simple, ASCII-based format, which can be produced or understood by other software systems and also by humans. Any document that can be created interactively in FrameMaker can also be represented, exactly and completely, in MIF. (The reverse, however, is not true: a few FrameMaker features are available only through MIF.) All versions of FrameMaker can export documents in MIF, and can also read MIF documents, including documents created by an earlier version or by another program. While working on his master's degree in astrophysics at Columbia University, Charles "Nick" Corfield, a mathematician alumnus of the University of Cambridge, decided to write a WYSIWYG document editor on a Sun-2 workstation. He got the idea from his college roommate at Columbia, Ben Meiry, who went to work at Sun Microsystems as a technical consultant and writer, and saw that there was a market for a powerful and flexible desktop publishing (DTP) product for the professional market. The only substantial DTP product at the time of FrameMaker's conception was Interleaf, which also ran on Sun workstations in 1981. Meiry saw an opportunity for a product to compete with Interleaf, enlisted Corfield to program it, and assisted him in acquiring the hardware, software, and technical connections to get him going in his Columbia University dorm room (where Corfield was still finishing his degree). Corfield programmed his algorithms quickly. After only a few months, Corfield had completed a functional prototype of FrameMaker. The prototype caught the eyes of salesmen at the fledgling Sun Microsystems, which lacked commercial applications to showcase the graphics capabilities of their workstations. They got permission from Corfield to use the prototype as demoware for their computers, and hence, the primitive FrameMaker received plenty of exposure in the Unix workstation arena. Steve Kirsch saw the demo and realized the potential of the product. Kirsch used the money he earned from Mouse Systems to fund a startup company, Frame Technology Corp., to commercialize the software. Corfield chose to sue Meiry for release of rights to the software so they could more easily obtain additional investment capital with Kirsch. Meiry had little means to fight a lengthy and expensive lawsuit with Corfield and his new business partners, and he chose to release his rights to FrameMaker and move on. In the early 1990s, a wave of UNIX workstation vendors—Apollo, Data General, MIPS, Motorola and Sony—provided funding to Frame Technology for an OEM version for their platforms. At the height of its success, FrameMaker ran on more than thirteen UNIX platforms, including NeXT Computer's NeXTSTEP and IBM's AIX operating systems. The NeXT and AIX version of FrameMaker used Display PostScript technology, whereas all other UNIX versions used the X Window System-Motif windowing environment. Sun Microsystems and AT&T were promoting the OPEN LOOK GUI standard to win over Motif, so Sun contracted Frame Technology to implement a version of FrameMaker on their PostScript-based NeWS windowing system. The NeWS version of FrameMaker was successfully released to those customers adopting the OPEN LOOK standards. At this point, FrameMaker was considered an extraordinary product for its day, enabling authors to produce highly structured documents with relative ease, but also giving users a great deal of typographical control in a reasonably intuitive and totally WYSIWYG way. The output documents could be of very high typographical quality. Frame Technology later ported FrameMaker to Microsoft Windows, but the company lost direction soon after its release. Up to this point, FrameMaker had been targeting a professional market for highly technical publications, such as the maintenance manuals for the Boeing 777 project, and licensed each copy for $2,500. But the Windows version brought the product to the $500 price range, which cannibalized its own non-Windows customer base. The company's attempt to sell sophisticated technical publishing software to the home DTP market was a disaster. A tool designed for a 1000-page manual was too cumbersome and difficult for an average home user to type a one-page letter. And despite some initially enthusiastic users, FrameMaker never really took off in the academic market, because of the company's unwillingness to incorporate various functions (such as support of endnotes or of long footnotes split across pages), or to improve the equation editor. Sales plummeted and brought the company to the verge of bankruptcy. After several rounds of layoffs, the company was stripped to the bare bones. 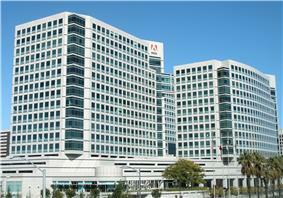 Adobe Systems acquired the product and returned the focus to the professional market. Today, Adobe FrameMaker is still a widely used publication tool for technical writers, although no version has been released for the Mac OS X operating system, limiting use of the product. The decision to cancel FrameMaker caused considerable friction between Adobe and Mac users, including Apple itself, which relied on it for creating documentation. As late as 2008, Apple manuals for OS X Leopard and the iPhone were still being developed on FrameMaker 7 in Classic mode; Apple has since switched to using InDesign. FrameMaker versions 5.x through 7.2 (from mid-1995 to 2005) did not contain updates to major parts of the program (including its general user interface, table editing, and illustration editing), concentrating instead on bug fixes and the integration of XML-oriented features (previously part of the FrameMaker+SGML premium product). FrameMaker did not feature multiple undo until version 7.2 (its 2005 release). FrameMaker 8 (2007) introduced Unicode, Flash, 3D, and built-in DITA support. Platform support was Windows (2000, XP, and Vista) and Sun Solaris (8, 9, and 10). FrameMaker 9 (2009) introduced a redesigned user interface and several enhancements, including: full support for DITA, support for more media types, better PDF output, and enhanced WebDAV-based CMS integration. Platform support for Sun Solaris and Windows 2000 was dropped, leaving Windows XP and Windows Vista as the sole remaining platforms. FrameMaker 10 (2011) again refined the user interface and introduced several changes, including: integration with content management systems via EMC Documentum 6.5 with Service Pack 1 and Microsoft SharePoint Server 2007 with Service Pack 2. There were several major competitors in the technical publishing market, such as Arbortext, Interleaf, and Corel Ventura. Many academic users now use LaTeX, because modern editors have made that system increasingly user-friendly, and LyX allows LaTeX to be generated with little or no knowledge of LaTeX. Another alternative is Scribus, a desktop publishing (DTP) application that is released under the GNU General Public License. Several formats, including DocBook XML, target authors of technical documents about computer hardware and software. Lastly, alternatives to FrameMaker for technical writing include Help authoring tools and XML editors. Released in 1989 (Mac version released in 1990). 2.1 was running on OSF/Motif. First version to include the Paragraph Designer, Character Designer, Cross Reference capability, and the equation editor (same version that ships with FrameMaker today). First version to support book level generated lists. Released in 1991. First Windows version available in 1992. 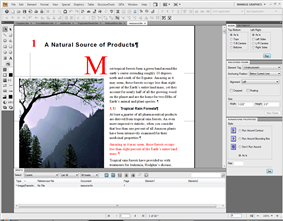 FrameMaker 3 introduced table support, hypertext support, and improved book support. In 1992 Sun introduced FrameBuilder (FrameMaker with SGML support). Released in 1993. FrameMaker 4 introduced Change Bars, Side Head support, run in paragraph format, and improvements on the Table Designer. Version 5.1 was released in 1995, and 5.1.2 in 1996. FrameMaker 5 introduced online help, long filename support in Windows 95, OLE support, rudimentary Save to HTML, and import text by reference. This major version also introduced FrameMaker and FrameMaker+SGML (to replace FrameBuilder). Released in 1997 (FrameMaker 5.5.6 was released in 1998) FrameMaker 5.5 introduced drag and drop dialogs, first Japanese localized version with doublebyte support, PDFMark support (PDFMark embeds bookmarks, links, and cross-references into PDF files automatically), color libraries (DIC, Focaltone, Munsell, Pantone, Toyo and Trumatch), language is embedded into Paragraph Designer and Character Designer, and Table designer now supports sorting by row or column. FrameMaker 5.5.6 beta was also the only version to run on Linux, however there was never a final version released due to poor feedback from potential customers. It was also the last version available for IRIX. Released in 2000. FrameMaker 6.0 introduced completely rewritten userguide, book wide find/replace and spell check, introduced new and improved chapter/book numbering system, compare document tool and bundled Quadralay WebWorks Publisher. Released in 2002. FrameMaker 7.0 introduced combined SGML and unstructured version, XML application support introduced, Save As PDF fixed, tagged PDF support, improved running header/footer support, document info stored in XMP format. FrameMaker 7.0 was the last version to run on the Macintosh (OS 8/9), HP/UX and IBM AIX. Released in 2003. FrameMaker 7.1 was bundled with Distiller 6, and included more OpenType fonts and can import Quark and Pagemaker documents. FrameMaker 7.1 on Unix now uses PDFLib and no longer relies on Distiller. FrameMaker 7.1 is only released on Windows and Solaris. Released in 2005. FrameMaker 7.2 introduced multiple undo, and included an unsupported DITA (Darwin Information Typing Architecture) application pack. It is bundled with WebWorks 8, and Distiller 7 (Unix version uses PDFLib). In 2006 Adobe released officially supported Framemaker 7.2 application packs for DITA and S1000D. Released in 2007. FrameMaker 8 introduced Unicode, Flash, 3D and built-in DITA support. A patch (8.0.1) was released during November, 2007 to fix a number of bugs and errors. Released in January, 2009. FrameMaker 9 contains a brand-new user interface and several productivity enhancements. New features included: full support for DITA, importing comments from PDF, enhanced WebDAV based CMS integration through native HTTP path support. Released in January, 2011. FrameMaker 10 included changes such as: DITA 1.2 support, DITA usability enhancements, author XML content, content management system support,scripting, automatically checking spelling, finding and changing overrides, using the table catalog, repeating the last operation, setting a poster: In videos, drag and drop editing, creating read/write rules, configuring the maker.ini file, text drag and drop, background colour and suppressing alerts. Released in July 2012. Framemaker 11 included native XML code view, author view, XSLT 2.0 and XPath 2.0 support, comprehensive DITA support, integration with popular content management systems, and enhanced video support. Released in January 2014. FrameMaker 12 included support for multichannel/multidevice publishing, support for MathML equations, integration with Adobe Experience Manager, simultaneous PDF-based reviews and authoring, smart catalogs, and out-of-the-box Dropbox integration. Released 2 June 2015. FrameMaker 2015 Release included full right-to-left language support for Hebrew and Arabic, a new PDF Maker with 32-bit and 64-bit installers, out-of-the-box multichannel, multidevice publishing, mobile app output, and many more features. ^ Nadile, Lisa. "Adobe to buy Frame, adding content apps to tools." PC Week 12.25 (1995): 3. Business Source Premier. EBSCO. Web. 6 June 2011. Element Descriptions in Structured FrameMaker 10 Using Element Descriptions to cut down writers’ training costs and efforts.